Is temperature control the most important factor in your mattress shopping experience? 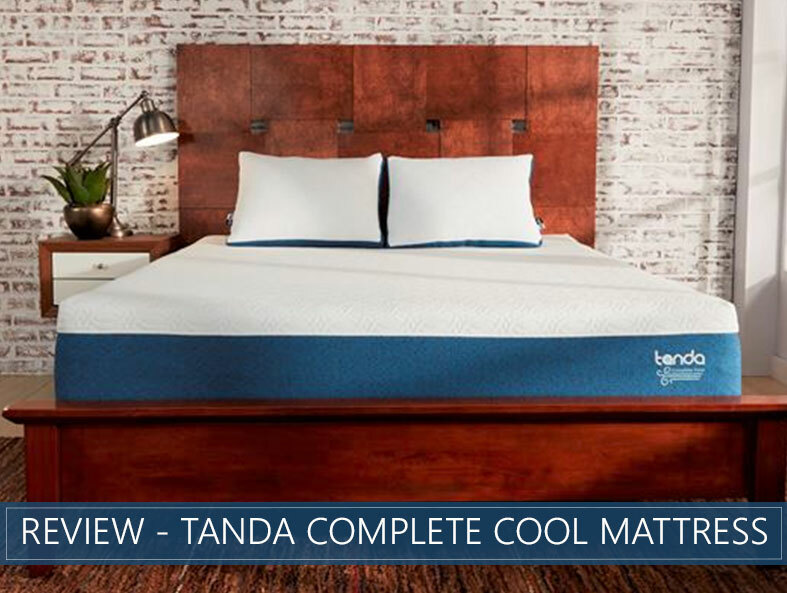 Tanda believes your bed should work for you and the most important ingredient for ideal sleep is temperature regulation. That’s why the Complete Cool mattress has been imbued with various cooling technologies designed to prevent overheating so you can rest easy. Our in-depth Tanda Complete Cool review will look at the cooling properties of this item along with other important aspects for buyers like pressure relief and motion control. We’ll break down the materials and construction of the bed and let you know who we think it is best-suited for. We will also provide rankings based on Firmness, comfort, value, and other key mattress buying considerations. Check out the entire review below to see our in-depth analysis of this product. Or skip to the end for a quick overview of its features and where it falls in our rankings. Prefer to sleep cool – Breathable fabrics, open-cell foams, Tencel materials, and ATROS temperature control technology infused into the cover should help to promote a cool sleep experience. Hot sleepers should find this product helps to eliminate overheating. Want a Medium comfort level – This bed should feel like a true Medium to Medium-Firm comfort level depending on the sleeper. This should is generally considered to be a universal comfort level that should be ideal for most sleep preferences. Like a gentle cradle – Shoppers should notice a minimal sinkage with a gentle cradling effect. There should be minimal body contouring but sleepers should feel well-supported with solid spinal support and alignment. Prefer a traditional memory foam feel – Those who prefer a deep hug with enhanced body contouring may want to seek out a traditional memory foam bed. 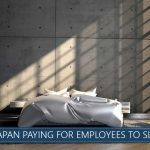 However, the gentle cradle of this all-foam mattress should provide pressure relief and an ease of repositioning that most shoppers should enjoy. For more options, check out our top mattress page. This item is an all-foam product that ships compressed in a box. The company suggests using a foundation, foundation with a frame, or a platform base with this product. It is also recommended to ensure the base is as sturdy as possible to provide optimal support to the bed. The cover features a snowy white top with a deep teal-colored base. The Tencel fabric cover is infused with ATROS temperature control technology. This material should feel soft and cool to the touch. This mattress is a total of 10 inches in height. 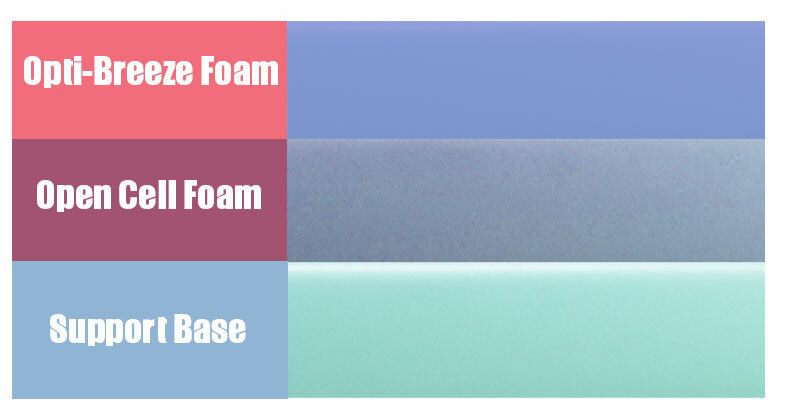 The first layer contains Opti-Breeze Foam which is designed to combine the feel of both latex and memory foam. This layer should be temperature neutral and should help to promote airflow. You should notice a somewhat faster response from the top layer compared to the rest of the foam, which should allow for easy repositioning. The second layer is comprised of Open Cell Foam which is meant to promote airflow and dampen vibrations throughout the bed. This layer should also provide extra comfort to help transition into the support foams below. The third layer is made up of a Support Base that should provide durability and stability to the entire bed. Note: Full specifications are not available on the company’s website. This mattress is ranked at a 5.5-6.5 on our Firmness scale. This system works with a scale of 1-10 in which 1 would feel extremely Soft and 10 would feel Firm as a rock. This ranking would land this mattress at a Medium to Medium-Firm comfort level which should be enjoyable for most shoppers. There should be minimal sinkage noticeable when lying on the bed. The gentle cradle and minimal contouring should help prevent you from feeling “stuck” in the foam. The ATROS technology in the top cover should pull cold air from your bedroom and redistribute it back to you to help prevent overheating. Bounce is minimal and the foams should be fairly slow to respond. However, the top layer responds quicker than those below, which, combined with the minimal sinkage, can help you to reposition easily. This may be ideal for combination sleepers who move around throughout the night. Most back sleepers should experience adequate lumbar support as the hips should sink just a little deeper than the rest of the body. This helps to keep the spine well-aligned. Though heavier areas of the body do sink a little more than the rest, stomach sleepers can find the comfort level of this mattress is Firm enough to prevent too much sinking in the hips to prevent their spine from becoming unaligned. Most side sleepers tend to prefer a Softer comfort level, but they should experience gentle pressure relief that helps to reduce a build-up of pressure in the shoulders and hips as they press into the top layers of the mattress. The universal Medium feel of this mattress, combined with easy repositioning and enhanced temperature regulation should appeal to most sleep preferences. You should notice very little motion transfer in this all-foam product. The multiple layers of foam should help to absorb energy, preventing vibrations from moving throughout the mattress. Co-sleepers should enjoy this enhanced motion control that should help to eliminate sleep disruptions. There may be some noticeable compression when sitting at the edge of the bed, though this is not often a major concern for most shoppers. Edge support should be considerably more sturdy when lying on the edge. Being able to use more of the sleep surface may be a welcome benefit for couples and people who share their mattress with pets or children. Trial Period – The company offers a 100-night trial for this product. Warranty – The mattress comes with a 10-year warranty. Shipping – Tanda ships free in the continental United States. CertiPUR-US® Certified – The foams inside this product are certified to be free of harmful additives such as formaldehyde or lead. Charitable Donations – Returned products will be donated to charity to help those in need. This mattress should provide a cool sleep experience and a universal comfort level that should appeal to a large population of sleepers. Tanda dedicated 20 years of research to create a product they felt would provide a cool and comfortable sleep experience. A gentle cradle and enhanced pressure relief combined with solid support and a universal Medium to Medium-Firm comfort level should make this item a great fit for sleepers of all position preferences. Tanda’s focus on providing comfort, pressure relief, and temperature control should take the hassle out of bedtime so you can rest easy. 27 Unique Canopy Bed Design Ideas – Modern, Traditional and More!